Protect every web app, hosted anywhere, in minutes. Calling Barracuda's WAF a Firewall is seriously selling it short. Complete application security does not have to be complicated. Application security is complicated to deploy and manage without specialized resources. Continuous updates to applications can lead to new vulnerabilities. Legacy applications were developed without secure coding practices. Built on a proven security platform. Enterprise-proven technology that provides comprehensive protection from all OWASP recognized security risks, DDoS attacks, and even the most advanced zero-day threats. Proactive bot defense ensures always-on protection from automated attacks, web scraping, and brute force attacks. Simplified application security for everyone. Remove the complexity of setting up and configuring your application security solution. 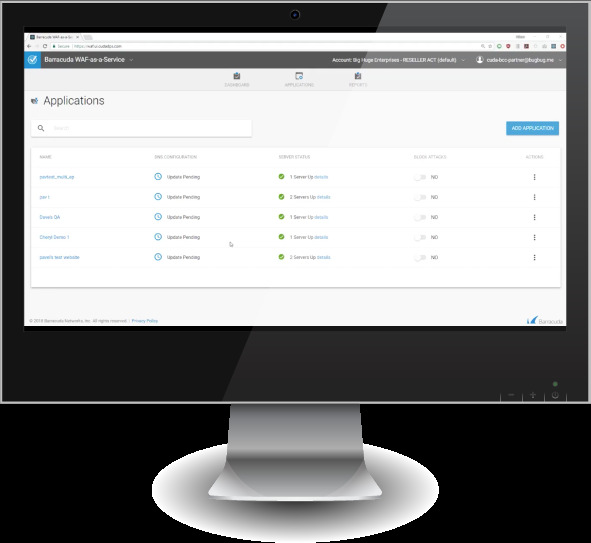 Barracuda WAF-as-a-Service delivers protection for your web apps in minutes thanks to a simple 5-step setup wizard, and numerous pre-built security policy templates. For more advanced users, Barracuda WAF-as-a-Service offers a level of control traditionally reserved only for on-premises and public cloud solutions. Fine-tune specific policies for each component of every application's security profile. Automated vulnerability discovery and remediation. Barracuda Vulnerability Remediation Service is built-in and provides automatic vulnerability detection and remediation which can be scheduled, ensuring ongoing protection without any administrative overhead. Granular visibility with detailed logs and reports. Gain rich insight into all web traffic events and users. Detailed compliance reports help you easily understand your security status at any given time by having complete visibility into all HTTP/S traffic. DDoS attacks disrupt the service availability of your web apps which can have a significant impact on your business. Barracuda WAF-as-a-Service defends against the full spectrum of L3-L7 DDoS attacks ensuring the availability of your web apps. with the completeness of an on-premises solution. Cloud-delivered WAF technologies for streamlined application protection.